We are the leading manufacturer, exporter and importer of Hospital Pillow Cover. 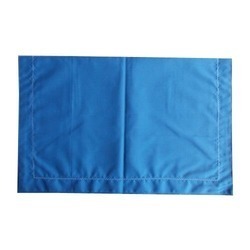 Known for our credibility in the market, we are engaged in providing a comprehensive array of Hospital Pillow Cover. These are demanded by nursing home, hospitals, clinics, etc. The offered covers are appreciated due to their flawless finish, perfect stitching, and best quality. These are made using best quality material under the supervision of expert personnel. Our product is stringently checked on various parameters to meet the industry laid standards.